We've reached a tipping point as we enter 2017. As Qlik, like many technology companies around the world, is in the midst of its annual kick-off events, I thought this was an interesting time to reflect on 2016 and think about the year ahead, showcasing some of the things I’m most excited about. Despite the title, I’m deliberately making no comments on 2016 in terms of elections or referendums, and certainly not making comments about the passing of global icons, for fear of losing more of them. 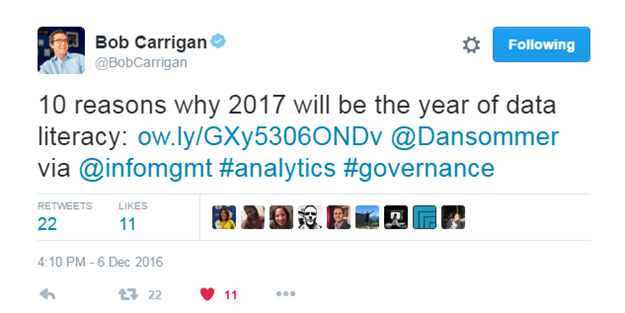 What do I take from 2016? 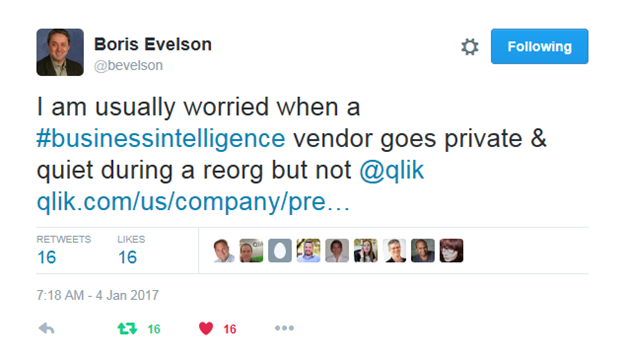 Firstly, it was an exciting year for Qlik as we transformed from being a public company to a private one and it was also the year of my second anniversary at Qlik. However, it was also an interesting year for the market as a whole. It was a year where the promise of stand-alone, cloud-only analytic vendors seemed to stall, and stack based and traditional BI solutions lost even more ground as modern BI platforms really stepped forward. At the same time, we started to see cloud and mega vendors set their sights on analytics, not because they find it interesting or really want to add value, but because they see it as great way to dictate their customers cloud and data strategies. I’m a firm believer the cloud stacks will fail for the same reasons the older stack approach failed. Only last week we announced that we are adding new advanced GeoAnalytics to both QlikView and Qlik Sense through our acquisition of our partner Idevio. 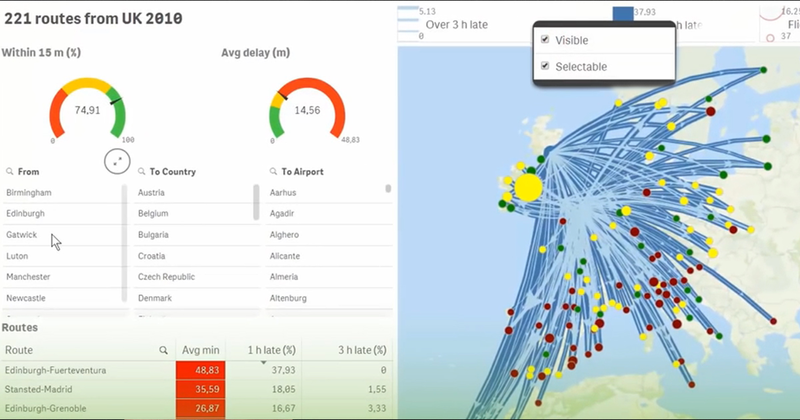 This is exciting because it provides an immediate opportunity for QlikView customers to take advantage of our new Qlik GeoAnalytics solution and easily add map visualizations and location-based analytics to their apps. Better still they can now do so from a single vendor. It’s also available for Qlik Sense today, and looking towards long term, we’ll see more of these capabilities fully integrated within our platform. Many would have you believe this is just about mapping but they are wrong, as my friend Mike Tarallo shows in his Qlik GeoAnalytics video. Forrester’s Boris Evelson seems as excited as me! Finally, 2017 is exciting because of all the cool innovation we will be delivering. As standard, we recently updated our Statement of Direction which sets out our vision for our cloud-ready platform and solutions. In a couple of weeks, I’ll be sharing the news of the release of Qlik Sense 3.2 and as we build to May and our Qonnections event, we’ll have even more exciting news. So perhaps a little overdue, but I wish you all a wonderful 2017, and hope to meet many of you on my travels over the course of the year. Here’s to another great year for Qlik!